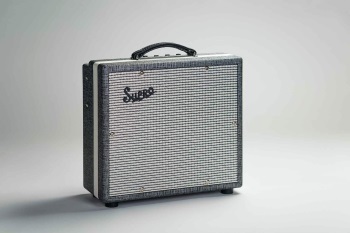 The Supro 1610 Comet is a high-gain, low-wattage 1 x 10 combo with reverb, tremolo and switchable power. Designed to act as a go-anywhere companion to your favorite guitars, this lightweight tube amp cranks out 6-Watts or 14-Watts of screaming hot vintage tone with an on-board option to drench your sound in tube-driven reverb and tremolo. The Comet is your desert island tube amplifier. The preamp found in the Comet delivers warm, blooming clean tones up until 12-o-clock on the volume knob. Past noon, the Comet’s voice rolls over into Supro crunch, giving way to a singing, violin-like overdrive at full volume. The Comet is remarkably high-gain for a vintage flavored amp and it nails that sweet-spot without being too loud for comfort. The Comet’s vintage correct tremolo effect occurs in the preamp, before the reverb. This 12Ax7-based tremolo circuit allows for wider overall speed range and a deeper effect as compared to our louder models where the tremolo happens in the power tubes, after the reverb. The power-amp found in the Comet uses a single 6L6 tube with switchable plate voltage to achieve studio and practice friendly 6 Watts or a more robust 14 Watts for stage use. The overdrive that occurs within the Comet’s “single-ended,” Class-A output stage is rich in even-order harmonics and soaked in tube compression. True to the legacy of the original, microphone-friendly Supro combos, the Comet’s exceptional dynamics and ultra-low noise performance make it an ideal recording amp. The Comet is dressed in 1959 Supro cosmetics, with Black Rhino Hide tolex, black piping, white welting and a gold faceplate. Similar in construction to our award winning Black Magick and Supreme amplifier models, there is no beam blocker in front of the Comet’s custom-made CR10 speaker, facilitating maximum throw and crystal-clear treble response from this compact all-tube masterpiece. A matching 1700 BD12 loaded, 1Ã—12 extension cabinet can also be hooked up to the Comet, bringing the overall speaker impedance load down to 4-ohms to deliver maximum punch and additional stage volume for gigs. The 1610 Comet, and the entire line of Supro amps is hand-assembled in by Absara Audio in Port Jefferson, NY, USA.